Our vintage apartment is located in the beautiful Chicago neighborhood of Lakeview with many ethnic restaurants and clubs with-in walking distance. Try a different ethnic specialty every night of the week. Stroll 2 blocks through the neighborhood to the elevated train to downtown or catch a cab at the corner. The lake front is less than a mile away and so is Wrigley Field. The apartment is the 1st floor of a vintage 2 flat with natural woodwork and updated and fully equipped kitchen and bath. It is comfortably and tastefully decorated to make you feel at home. Just unpack your bags and make this your home away from home. Our beds and linens are high quality insuring a good nights sleep. City of Chicago License: The City of Chicago now licenses apartments. It is only legal to rent a licensed accommodation in the City of Chicago. All licensed apartments/condo's for rent less than 30 nights per stay are required to post their license # on advertisements. Licensed apartments are inspected and regulated by the City of Chicago for your protection. Do not rent unlicensed units. My wife and I have enjoyed living in our vintage 2 flat on the tree lined street in this Lakeview neighborhood for the last 25 years. So many places are is walking distance that we rarely use our car except for work. We have rented our 1st. floor as a short term vacation/temp apartment for the last 9 years and have hosted guests from all over the world to locals relocating or remodeling. We have truly enjoyed hosting guests that have come to explore the city, go to a ball game, a special family occasion or conference that brings them to Chicago. We purchased our 2 flat located in this north side neighborhood almost 34 years ago as a place to live and raise a family. We have never regretted moving to Lakeview. It is a vibrant neighborhood filled with tree lined streets lined with vintage maintained homes and apartments. This is a true Chicago neighborhood. Filled with a healthy mix of young families and singles as well as older long time residents. It is very walk able. There is little reason to need a car. Excellent public transportation to downtown and Lakeview is a very walk able part of town. It has been rated 92% on the walk ability index. Just a great place to experience a Chicago neighborhood. The side yard adds light to the apartment and the yard is just a great place to sit out with a cup of coffee or have a bbq dinner and eat at your table set on the stone patio. Full size washer and dryer are located in the unit! Available at extra charge. Street parking permits available at no charge. New dishwasher. Very quite and does a great job! Fully equipped kitchen ready for the chef to work their magic or just make a great cup of coffee in the morning. We supply the coffee! We have a wonderful patio located just out the back door. Shaded so it is comfortable even on hot summer days. We do have street parking and the east side of Racine Ave. is permit parking between 6PM and 6AM which makes parking easier in the evening. We supply parking permits for your use. Garage: Available at extra charge. Street parking permits available at no charge. The grill is located in the yard for your use. We have a wonderful patio located just out the back door. Shaded so it is comfortable even on hot summer days. Free Long Distance: Free long distance service to anywhere in the US. Just pick up the phone and dial! The apartment is centrally located in the Lakeview neighborhood. A true Chicago neighborhood filled with small shops, ethnic restaurants and good public transportation. This neighborhood is car optional. The apartment is about 1 mile south of Wrigley Field and one Mile west of the wonderful Lakefront parks. It is 2 blocks from the Brown Line elevated train(the El) to downtown and the museums. There are always cabs for hire just outside your front door and the shops and restaurants all with in walking distance. So no mater what has brought you to Chicago you will be centrally located to take in a ball game enjoy the beach or spend a day exploring downtown and all the museums. If you do come by car we provide parking stickers which allow you to street park close by. 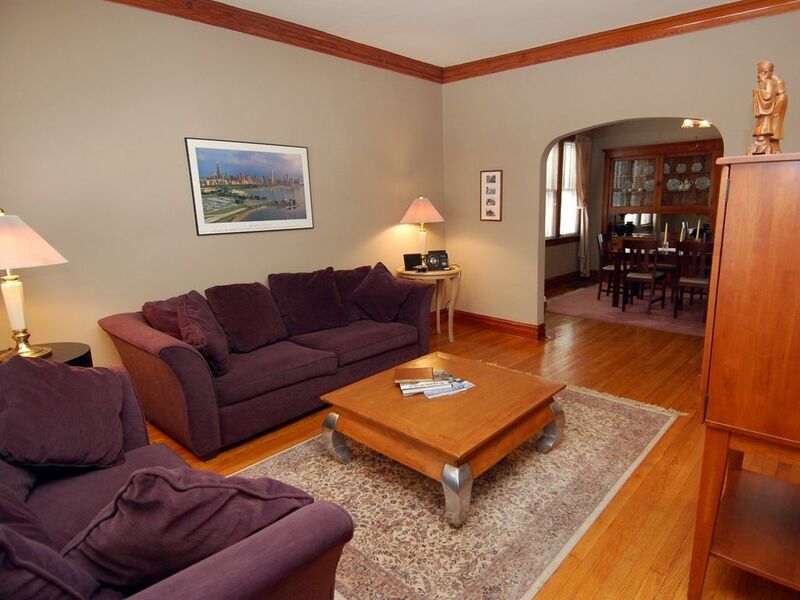 Our 1st floor apartment is a classic vintage apartment fully equipped ready to be your home during your Chicago stay. Other Activities: Take in a ball game at the 'Friendly confines of Wrigley Field'! Free Lincoln Park Zoo is only 1.5 miles from the apartment. A really great zoo with conservatory gardens. Our incredible lake front is just 1 mile due east. A great destination for a day of sun and people watching. Our neighborhood is made up of single family homes,apartments and small shops and restaurants. The buildings range in age from new to over 100 years old. A walk through the neighborhood is a architectural tour of Chicago buildings. There is a Divvy Bike rental just down the street for convenient daily bike rental. Golf: Waveland Golf Course is a 9 hole golf course located right on our lake front. A really wonderful round of golf!